Continuing last week’s article on customized combo-boxes (a.k.a. 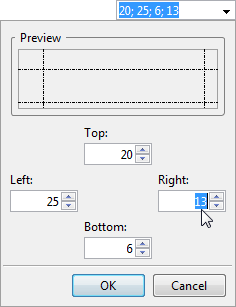 popup menus or drop-downs), today I discuss how we can use JIDE‘s vast array of custom professional combo-boxes in our Matlab GUI. As I’ve already noted here in several articles, Matlab heavily uses JIDE’s library of GUI controls for its own GUI (Desktop, Editor etc.) and we can tap into this wealth of components in our own GUI. I’ve recently shown an example of this in my treeTable utility, which greatly extends Matlab’s standard uitable. After using treeTable for a while, it’s difficult to go back to using the plain standard uitable… A similar experience will undoubtedly occur after using some of JIDE’s combo-boxes. JIDE’s combo-box controls are generally grouped in the JIDE Grids package and extend the standard Java Swing JComponent (JIDESoft actually found it easier to extend JComponent than JComboBox, but users really have nothing to complain – all the extra functionality and more have simply been reimplemented). The JIDE Grids package is included in each Matlab installation (/java/jarext/jide/jide-grids.jar under the Matlab root). In particular, JIDE Grids includes the com.jidesoft.combobox Java package, which groups the combo-box components. You can find further details on JIDE Grids in the Developer Guide and the Javadoc documentation. 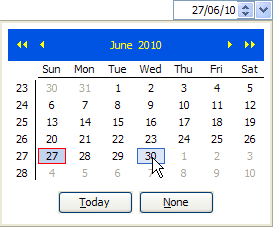 Back in 2010, I explained how we can use one of these components, DateComboBox, and its close associate DateSpinnerComboBox. Today I extend the coverage to briefly examine JIDE’s other custom combo-box controls. Each of the following classes has both a combo-box control and a corresponding panel that is presented when the combo-box arrow button is clicked (activated). The panel is normally called xxxChooserPanel and its corresponding combo-box is called xxxComboBox. So, for example, we would have ColorComboBox coupled with ColorChooserPanel. After the combo-box is created, the panel can be accessed and customized via the combo-box’s PopupPanel property or the corresponding getPopupPanel() method. The panel can also be displayed as a standalone control, as I’ve shown in the DateComboBox article. 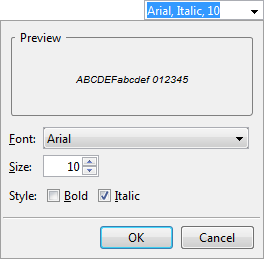 GUI designers can choose whether to use a compact combo-box or the full-size panel control. MultilineStringComboBox – a combo box that enables entering a string item that has multiple lines of text. A similar control is StringArrayComboBox that simply formats the multi-line string differently in the result, separating the multi-lines with a ‘;’ character. CheckBoxListComboBox – a combo-box that presents a multi-selection panel using check-boxes. It will be discussed in next week’s article. CalculatorComboBox – a combo-box control that displays the result of simple arithmetic calculations. Possible customizations include the ability to set the calculator buttons’ size and gap, the displayed number format, the initial value etc. – all via the Calculator property that returns a customizable com.jidesoft.swing.Calculator object. ColorComboBox – a combo-box control that enables color selection. 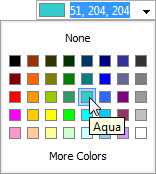 Matlab includes a large number of color selectors, as explained in this article. Possible customizations of the ColorComboBox control include the ability to hide the color’s RGB value (ColorValueVisible property, boolean, default=true), hide the colored icon rectangle (ColorIconVisible property, boolean, default=true), make the control look like an editbox rather than a combo-box (ButtonVisible property, boolean, default=true), allow the “More colors…” features (AllowMoreColors, boolean, default=true) etc. 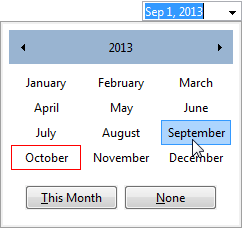 DateComboBox – presents a date-selection combo-box, whose attributes (day/month names, display format etc.) are taken from the system definitions. JIDE’s date-selection components were discussed in a dedicated article. Possible customizations include the ability to display an integrated time-selector sub-component (via the TimeDisplayed property: boolean, default=false and TimeFormat string), week numbers (ShowWeekNumbers, boolean, default=true), <OK> button (ShowOKButton, boolean, default=false), the <Today> button (ShowTodayButton, boolean, default=true) and the <None> button (ShowNoneButton, boolean, default=true). FileChooserComboBox – a combo-box that displays a file-selection window when activated. Customizations include the ability to set the CurrentDirectoryPath used by the popup window. Each combo-box control accepts its combo-list elements somewhat differently. For example, for DateComboBox we can specify the acceptable date-range (via DefaultDateModel) and initial date, for a FontComboBox we can specify the initial font, and for any of the list controls we need to specify the list elements (as a cell-array of strings). However, most if not all of these components have default constructors so we can initialize the controls without any inputs and let it automatically use the defaults. 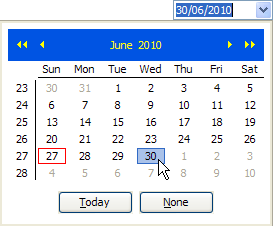 For example, the date-selection controls will use the current date (today) as its default value. Next week I plan to present a non-trivial customization of the CheckBoxListComboBox control. Additional discussion of JIDE’s combo-boxes, and JIDE controls in general, is available in Chapter 5 of my Matlab-Java Programming book. If you need to integrate professional-looking controls such as these in your Matlab GUI, consider hiring my consulting services. Note that JIDE is a commercial product. We may not use it without JIDESoft’s permission outside the Matlab environment. It is my understanding however, that we can freely use it within Matlab. Note that this is not legal advise as I am an engineer, not a lawyer. If you have any licensing questions, contact sales@jidesoft.com. Arash Marashian (12 days 23 hours ago): Problem Solved. I found out that my version does not have this icon. thanks. Marshall (14 days 2 hours ago): This was a fun puzzle–don’t hesitate to add more posts like these if you come across some other fun ones! Reza (14 days 8 hours ago): I have the same problem. this Java widget got error in compiling via Matlab 2018! Could you please show me how to solve this? GGa (16 days 2 hours ago): There isn’t anything “outside the UTF-8 range”. UTF-8 can represent any Unicode character, as far as I know.